This expansion of air on heating became widely known in classical times, and was used in various dramatic devices. For example, Hero of Alexandria describes a small temple where a fire on the altar causes the doors to open. Within some reasonable temperature range, we can get a rough idea how warm something is by touching it. But this can be unreliable—if you put one hand in cold water, one in hot, then plunge both of them into lukewarm water, one hand will tell you it’s hot, the other will feel cold. For something too hot to touch, we can often get an impression of how hot it is by approaching and sensing the radiant heat. If the temperature increases enough, it begins to glow and we can see it’s hot! The problem with these subjective perceptions of heat is that they may not be the same for everybody. If our two hands can’t agree on whether water is warm or cold, how likely is it that a group of people can set a uniform standard? We need to construct a device of some kind that responds to temperature in a simple, measurable way—we need a thermometer. The first step on the road to a thermometer was taken by one Philo of Byzantium, an engineer, in the second century BC. He took a hollow lead sphere connected with a tight seal to one end of a pipe, the other end of the pipe being under water in another vessel. To quote Philo: “…if you expose the sphere to the sun, part of the air enclosed in the tube will pass out when the sphere becomes hot. This will be evident because the air will descend from the tube into the water, agitating it and producing a succession of bubbles. “No matter how many times you repeat the operation, the same thing will happen. Notice that Philo did what a real investigative scientist should do—he checked that the experiment was reproducible, and he established that the air’s expansion was in response to heat being applied to the sphere, and was independent of the source of the heat. Still, none of these ingenious devices is a thermometer. There was no attempt (at least none recorded) by Philo or his followers to make a quantitative measurement of how hot or cold the sphere was. And the “meter” in thermometer means measurement. Galileo claimed to have invented the first thermometer. Well, actually, he called it a thermoscope, but he did try to measure “degrees of heat and cold” according to a colleague, and that qualifies it as a thermometer. (Technically, a thermoscope is a device making it possible to see a temperature change, a thermometer can measure the temperature change.) Galileo used an inverted narrow-necked bulb with a tubular neck, like a hen’s egg with a long glass tube attached at the tip. He first heated the bulb with his hands then immediately put it into water. He recorded that the water rose in the bulb the height of “one palm”. Later, either Galileo or his colleague Santorio Santorio put a paper scale next to the tube to read off changes in the water level. This definitely made it a thermometer, but who thought of it first isn’t clear (they argued about it). And, in fact, this thermometer had problems. Question: what problems? If you occasionally top up the water, why shouldn’t this thermometer be good for recording daily changes in temperature? Answer: because it’s also a barometer! But—Galileo didn’t know about the atmospheric pressure. Torricelli, one of Galileo’s pupils, was the first to realize, shortly after Galileo died, that the real driving force in suction was external atmospheric pressure, a satisfying mechanical explanation in contrast to the philosophical “nature abhors a vacuum”. In the 1640’s, Pascal pointed out that the variability of atmospheric pressure rendered the air thermometer untrustworthy. Liquid-in-glass thermometers were used from the 1630’s, and they were of course insensitive to barometric pressure. Meteorological records were kept from this time, but there was no real uniformity of temperature measurement until Fahrenheit, almost a hundred years later. The first systematic account of a range of different temperatures, “Degrees of Heat”, was written by Newton, but published anonymously, in 1701. Presumably he felt that this project lacked the timeless significance of some of his other achievements. Newton tried to estimate the higher temperatures indirectly. He heated up a piece of iron in a fire, then let it cool in a steady breeze. He found that, at least at the lower temperatures where he could cross check with his thermometer, the temperature dropped in a geometric progression, that is, if it took five minutes to drop from 80° above air temperature to 40° above air temperature, it took another five minutes to drop to 20° above air, another five to drop to 10° above, and so on. He then assumed this same pattern of temperature drop was true at the high temperatures beyond the reach of his thermometer, and so estimated the temperature of the fire and of iron glowing red hot. This wasn’t very accurate—he (under)estimated the temperature of the fire to be about 600°C. The first really good thermometer, using mercury expanding from a bulb into a capillary tube, was made by Fahrenheit in the early 1720’s. He got the idea of using mercury from a colleague’s comment that one should correct a barometer reading to allow for the variation of the density of mercury with temperature. The point that has to be borne in mind in constructing thermometers, and defining temperature scales, is that not all liquids expand at uniform rates on heating—water, for example, at first contracts on heating from its freezing point, then begins to expand at around forty degrees Fahrenheit, so a water thermometer wouldn’t be very helpful on a cold day. It is also not easy to manufacture a uniform cross section capillary tube, but Fahrenheit managed to do it, and demonstrated his success by showing his thermometers agreed with each other over a whole range of temperatures. Fortunately, it turns out that mercury is well behaved in that the temperature scale defined by taking its expansion to be uniform coincides very closely with the true temperature scale, as we shall see later. A little earlier (1702) Amontons introduced an air pressure thermometer. He established that if air at atmospheric pressure (he states 30 inches of mercury) at the freezing point of water is enclosed then heated to the boiling point of water, but meanwhile kept at constant volume by increasing the pressure on it, the pressure goes up by about 10 inches of mercury. He also discovered that if he compressed the air in the first place, so that it was at a pressure of sixty inches of mercury at the temperature of melting ice, then if he raised its temperature to that of boiling water, at the same time adding mercury to the column to keep the volume of air constant, the pressure increased by 20 inches of mercury. In other words, he found that for a fixed amount of air kept in a container at constant volume, the pressure increased with temperature by about 33% from freezing to boiling, that percentage being independent of the initial pressure. Once the thermometer came to be widely used, more precise observations of temperature and (as we shall see) heat flow became possible. Joseph Black, a professor at the University of Edinburgh in the 1700’s, noticed that a collection of objects at different temperatures, if brought together, will all eventually reach the same temperature. If two objects are in thermal equilibrium with a third, then they are in thermal equilibrium with each other. The “third body” in a practical situation is just the thermometer. It’s perhaps worth pointing out that this trivial sounding statement certainly wasn’t obvious before the invention of the thermometer. With only the sense of touch to go on, few people would agree that a piece of wool and a bar of metal, both at 0°C, were at the same temperature. The next obvious question is, can we get more quantitative about this “flow of heat” that takes place between bodies as they move towards thermal equilibrium? For example, suppose I reproduce one of Fahrenheit’s experiments, by taking 100 ccs of water at 100°F, and 100ccs at 150°F, and mix them together in an insulated jug so little heat escapes. What is the final temperature of the mix? Of course, it’s close to 125°F—not surprising, but it does tell us something! It tells us that the amount of heat required to raise the temperature of 100 cc of water from 100°F to 125°F is exactly the same as the amount needed to raise it from 125°F to 150°F. A series of such experiments (done by Fahrenheit, Black and others) established that it always took the same amount of heat to raise the temperature of 1 cc of water by one degree. 1 calorie is the heat required to raise the temperature of 1 gram of water by 1 degree Celsius. The specific heat of a substance is the heat required in calories to raise the temperature of 1 gram by 1 degree Celsius. As Fahrenheit continues his measurements of heat flow, it quickly became evident that for different materials, the amount of heat needed to raise the temperature of one gram by one degree could be quite different. For example, it had been widely thought before the measurements were made, that one cc of Mercury, being a lot heavier than one cc of water, would take more heat to raise its temperature by one degree. This proved not to be the case—Fahrenheit himself made the measurement. In an insulating container, called a “calorimeter” he added 100ccs of water at 100°F to 100ccs of mercury at 150°F, and stirred so they quickly reached thermal equilibrium. Question: what do you think the final temperature was? Approximately? Answer: The final temperature was, surprisingly, about 120°F. 100 cc of water evidently “contained more heat” than 100 cc of mercury, despite the large difference in weight! 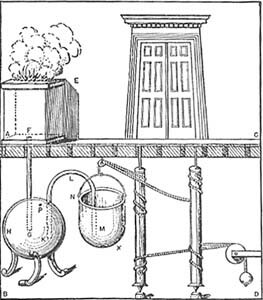 This technique, called calorimetry, was widely used to find the specific heats of many different substances, and at first no clear pattern emerged. It was puzzling that the specific heat of mercury was so low compared with water! As more experiments on different substances were done, it gradually became evident that heavier substances, paradoxically, had lower specific heats. Meanwhile, this quantitative approach to scientific observation had spread to chemistry. Towards the end of the 1700’s, Lavoisier weighed chemicals involved in reactions before and after the reaction. This involved weighing the gases involved, so had to be carried out in closed containers, so that, for example, the weight of oxygen used and the carbon dioxide, etc., produced would accounted for in studying combustion. The big discovery was that mass was neither created nor destroyed. This had not been realized before because no one had weighed the gases involved. It made the atomic theory suddenly more plausible, with the idea that maybe chemical reactions were just rearrangements of atoms into different combinations. Much effort was expended carefully weighing the constituents in many chemical reactions, and constructing diagrams of the molecules. The important result of all this work was that it became possible to list the relative weights of the atoms involved. For example, the data on H2O and H2O2 led to the conclusion that an oxygen atom weighed sixteen times the weight of a hydrogen atom. It must be emphasized, though, that these results gave no clue as to the actual weights of atoms! All that was known was that atoms were too small to see in the best microscopes. Nevertheless, knowing the relative weights of some atoms in 1820 led to an important discovery. Two professors in France, Dulong and Petit, found that for a whole series of elements the product of atomic weight and specific heat was the same! The significance of this, as they pointed out, was that the “specific heat”, or heat capacity, of each atom was the same—a piece of lead and a piece of zinc having the same number of atoms would have the same heat capacity. So heavier atoms absorbed no more heat than lighter atoms for a given rise in temperature. This partially explained why mercury had such a surprisingly low heat capacity. Of course, having no idea how big the atoms might be, they could go no further. And, indeed, many of their colleagues didn’t believe in atoms anyway, so it was hard to convince them of the significance of this discovery. as a function of time. He found it steadily increased, reflecting the supply of heat from the fire, until the water began to boil, whereupon the temperature stayed the same for a long time. The steam coming off was at the same (boiling) temperature as the water. So what was happening to the heat being supplied? Black correctly concluded that heat needed to be supplied to change water from its liquid state to its gaseous state, that is, to steam. In fact, a lot of heat had to be supplied: 540 calories per gram, as opposed to the mere 100 calories per gram needed to bring it from the freezing temperature to boiling. He also discovered that it took 80 calories per gram to melt ice into water, with no rise in temperature. This heat is released when the water freezes back to ice, so it is somehow “hidden” in the water. He called it latent heat, meaning hidden heat. A Source Book in Greek Science, M. R. Cohen and I. E. Drabkin, Harvard university Press, 1966. A History of the Thermometer and its Uses in Meteorology, W. E. Knowles Middleton, Johns Hopkins Press, 1966. A Source Book in Physics, W. F. Magie, McGraw-Hill, New York, 1935.